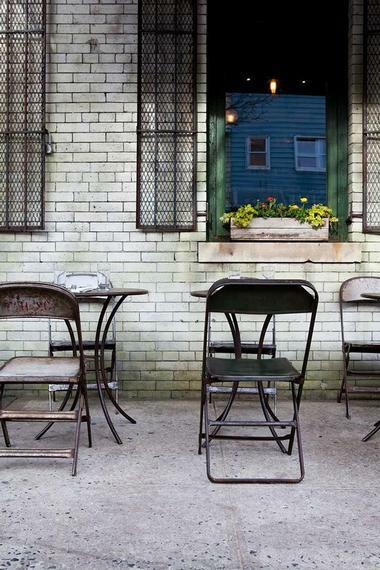 Breakfast is often considered one of the most important meals of the day, and there’s no better place to have it than in the artsy and historic atmosphere Brooklyn offers. 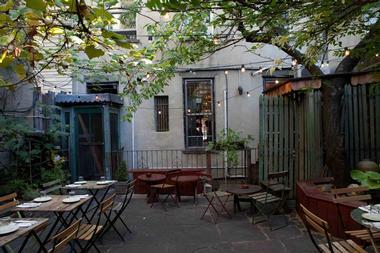 From the serene gardens at Vinegar Hill House to the stunning views of Manhattan’s skyline at the River Cafe, there’s a relaxing and friendly atmosphere for all. 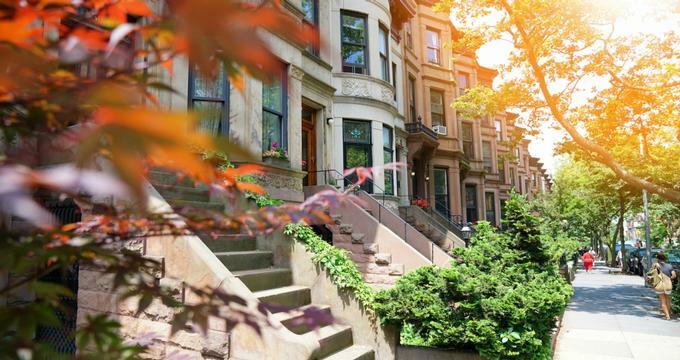 It’s no secret that New York has some of the finest cuisine in the nation, and the following list of restaurants has everything from hot pepper home fries and mashed green plantains to mouth-watering buttermilk pancakes and truffle egg toast. Open from 6:00 a.m. to 6:00 p.m. every day of the week, Angie’s Breakfast Spot has an extensive menu filled with Spanish and American dishes. The food hits the right spot, whether you’re looking to cure a hangover from the wild night before or you want to grab a hearty meal before work. The Supreme Scrambler Omelet is a favored choice and comes with toast, bacon, ham, sausage, Monterey and cheddar cheese, a choice of home fries, French fries, or grits, and coffee or tea. All of that is only $7.75 so dining at Angie’s is easy on the pocket too. Their Spanish breakfast menu also features the satisfying Mangu, which has mashed green plantains, salami, eggs, and cheese. 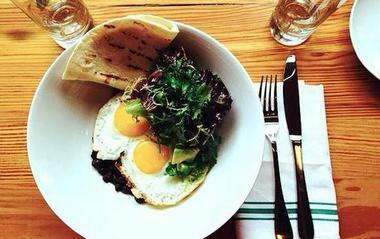 Sunday in Brooklyn is a great place for a relaxed and laid-back breakfast or brunch. The restaurant was opened by three friends who, after strenuous work weeks, spent their Sundays celebrating the city and feasting on delicious food and drink. Wanting to offer the same experience to others, Sunday in Brooklyn is a great spot for a satisfying breakfast or brunch. You can have a light breakfast of charred avocado toast or something heartier like a cheddar scramble with home fries, bacon, and sausage. Breakfast is available every day from 8:30 a.m. to 9:30 a.m. while brunch is served from 9:30 a.m. to 3:30 p.m. (4:00 p.m. on weekends). Atrium DUMBO is located just off Brooklyn Bridge Park on the cobblestone streets of the DUMBO neighborhood. Here, they use seasonal, locally-sourced ingredients to create simple and savory French-inspired cuisine that highlights the food’s natural flavors. The industrial-chic restaurant offers brunch on the weekends from 11:00 a.m. to 3:00 p.m. The menu ranges from assorted fruit plates and organic yogurt with homemade granola to scrambled eggs with charred kale and eggs Florentine with crab or lobster. There are three delectable desserts on the menu: the vanilla panna cotta, brioche doughnuts with butterscotch, and the Valrhona dark chocolate mousse made with Aleppo pepper. Buttermilk Channel is the brainchild of native New Yorker Doug, who had previously worked in renowned restaurants such as the Blue Water Grill, La Grenouille, and Picholine. 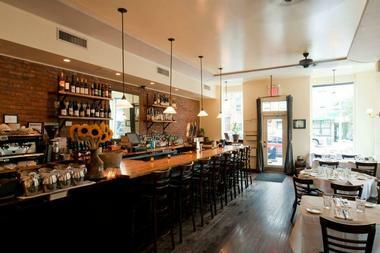 Located in Carroll Gardens, the restaurant has a renowned brunch menu available on weekends from 10:00 a.m. to 3:00 p.m. Diners can have a light snack such as maple & bacon roasted almonds or a walnut sticky bun or have a proper meal such as the short rib hash, which comes with sunny-side-up eggs and organic greens. You can add sides such as cheddar waffles or buttermilk biscuits and drink it all down with a rosemary-infused bloody Mary or a sparkling mimosa. Cafe Mogador Williamsburg is open every day of the year from 9:00 a.m. to 12:30 a.m. from Sunday to Thursday and from 9:00 a.m. to 1:30 a.m. on Friday and Saturday. The Moroccan restaurant is charming and offers many American breakfast items that diners can add a traditional twist to. For example, you can have a “simple breakfast” with two eggs and seven grain toast, or a Moroccan breakfast with two eggs, spicy stewed tomatoes, and pita bread. In addition to the mouth-watering banana buttermilk pancakes and organic maple almond granola, diners can also try the Middle Eastern eggs served with tabbouleh, hummus, an Arabic salad, and zaatar pita. Every weekend from 10:00 a.m. to 4:00 p.m., locals and visitors in Brooklyn can head to the Diner for a brunch menu with absolutely scrumptious items. 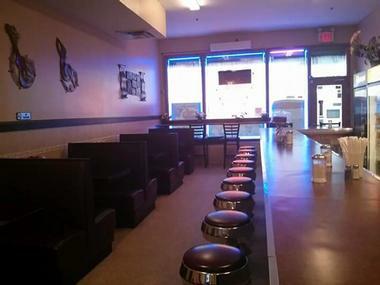 The Diner opened in 1999 on New Year’s Eve and has been serving customers delicious culinary concoctions since then. The menu changes daily depending on what’s in season and what the chef feels like cooking up in the kitchen. Some of the brunch constants include buckwheat pancakes, apple coffee cake, fried pork shoulder, salmon and eggs, and sides such as fried potatoes, kale, polenta, bacon, and toast and jam. At Egg, you can have breakfast all day, every day. The rustic-industrial restaurant offers delicious Southern breakfasts from 7:00 a.m. to 5:00 p.m. Monday to Friday and 8:00 a.m. to 5:00 p.m. on Saturday and Sunday. Breakfast is looked at as a way to welcome a new day at Egg so they pull out all the stops when it comes to putting together a delicious meal. Entrees include biscuits and gravy, Grafton cheddar omelet, eggs Rothko, and organic grits and eggs. One of the more popular options is the Country Ham Biscuit. For only $12, diners can have country ham bought in from Kentucky with biscuits, Grafton cheddar, grits, and homemade fig jam. Five Leaves is a fun, laid-back bistro that serves American cuisine with a bit of an Australian touch. The restaurant sources local produce and sustainable seafood, meat, and poultry to create scrumptious breakfast and brunch offerings. Popular items on the menu are the matcha chia pudding with candied ginger, the mushroom toast with sautéed kale, and the daily quiche with a side of fresh greens. During brunch, you can try some really unique creations, including the Devils on Horseback, which are bacon wrapped medjool dates with habanero vincotto and almonds. If there’s any more space in your stomach, be sure to include a side of truffle fries with your meal. Le Barricou is a laid-back French bistro in East Williamsburg that offers a famed weekend brunch from 10:00 a.m. to 4:00 p.m. Funnily enough, Le Barricou also has what they call a late brunch that is offered for two hours after brunch. The restaurant was founded in 2006 and has become a fun and hospitable place for Brooklyn locals and visitors to have a fresh, creative meal inspired by brasseries in France. The menu is varied and has everything from an assorted mini-pastry basket to steak and eggs made from all-natural black angus hanger steak. The Croque Madame is a good choice and includes French country bread with gruyere cheese, black forest ham, a sunny egg, and hand cut pommes frites. Meadowsweet was opened by Stephanie Lempert and her husband Polo Dobkin, the executive chef who has been awarded the Michelin Star twice for his cooking at the restaurant. Every weekend from 11:00 a.m. to 3:00 p.m., you can try his preparations during the extensive brunch filled with New American cuisine influenced by Mediterranean flavors. Many items on the menu include fresh vegetables that were grown in the couple’s Meadowsweet Farm. Brunch includes starters such as tamales and truffle egg toast and mains such as the huevos rancheros and delicious portobello, brussel sprouts, and goat cheese omelet. You can add sides such as bacon or home fries as you sip on one of many brunch cocktails. Brooklyn diners can partake in the delicious weekend brunch at Peaches, which offers a modern spin on Souther comfort food. The brunch menu changes seasonally to make the best of fresh and readily-available ingredients. The menu, which has starters, scrambles, smoked fish, mains, sandwiches, and sides, has some unique items on the menu. The fried green tomatoes are a crowd pleaser, and no one can go wrong with the basic breakfast consisting of eggs, sausage, potatoes, and toast. If you’re looking for something out of this world, go for the shrimp and grits, which has tiger shrimp, kale, mushrooms, and chilies. If you’re in the mood for a late breakfast or a relaxing weekend brunch, head to Pies ‘n’ Thighs on the corner of 4th Street and Driggs Avenue. 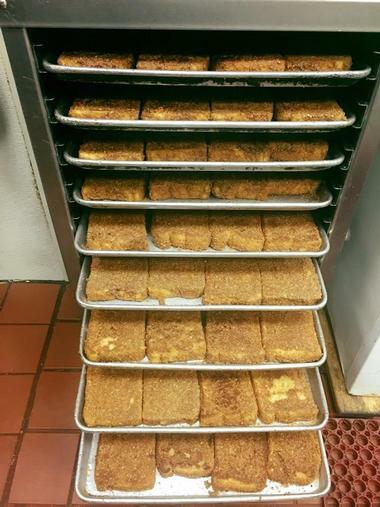 The breakfast and lunch menu are combined, so diners can have anything from a well-seasoned fried catfish box to a more traditional egg breakfast with biscuits, jam, and grits. You shouldn’t miss out on the brunch specials: the chicken fried steak with eggs, gravy, and salsa verde and the scramble special with roasted brussel sprouts and biscuits. Breakfast is served from 9:00 a.m. to 4:00 p.m. Monday to Friday, and brunch is available 10:00 a.m. to 4:00 p.m. on Saturday and Sunday. Restaurant-goers can have brunch any day of the week at Piquant; it is offered between 10:00 a.m. and 4:00 p.m. Tuesday to Friday and 10:00 a.m. to 3:30 p.m. on the weekends. The modern take on traditional cuisine goes well with the unique decor and atmosphere of the restaurant and bar. The stuffed breakfast burrito and the apple cinnamon pancakes are favored by many, while the grilled portobello burger is a popular vegetarian item on the menu. They haven’t forgotten the drinks – a small mimosa or sangria pitcher is only $12 while the large pitcher is $22. Breakfast and brunch are available every day at Rabbithole, a casual and rusti, American eatery of wood and brick. The restaurant and bar, which has a laid-back setting in the front and a more formal dining area in the back, was opened to please even the most discerning palette. 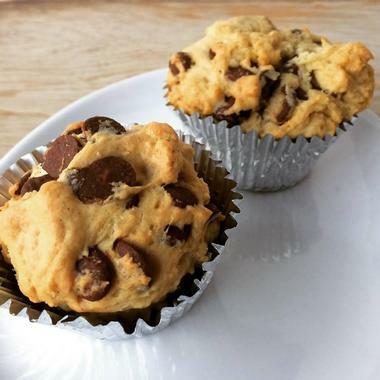 The pastries offered are made fresh at Rabbithole’s very own bakery from scratch, so don’t miss out on indulging in the muffins, scones, and cookies while there. The breakfast and brunch menus are available from 9:00 a.m. to 5:00 p.m. every day and French-style soft omelets, stuffed French toast, steak and eggs, and a delicious beet avocado and goat cheese sandwich. 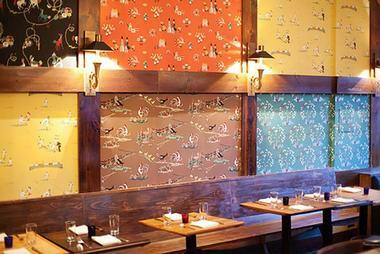 Reynard is an upscale New American eatery that can be found within the Wythe Hotel. You can enjoy their seasonal eats for breakfast on weekdays between 7:00 a.m. and 11:00 a.m. and during their weekend brunch from 10:00 a.m. to 4:00 p.m. The pastries on the menu are delectable, and diners can have anything from an apple almond muffin to a gruyere and chive croissant. Items on the breakfast menu include egg on a roll with roasted pork and sauerkraut, dippy eggs with kefir butter, and sourdough pancakes with maple syrup. 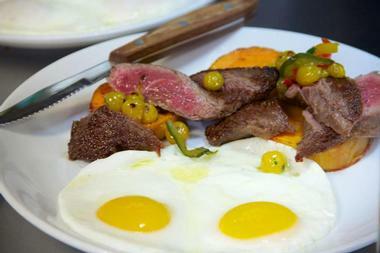 During weekend brunch, you can indulge in steak and sunny eggs, a grass-fed burger, pastrami sandwich, and pitchers of wine, cocktails, and draft beers. Rose Water is a seasonal American restaurant that offers meals made with local, organic, and sustainably-raised ingredients. The menu changes weekly depending on what is freshly available. 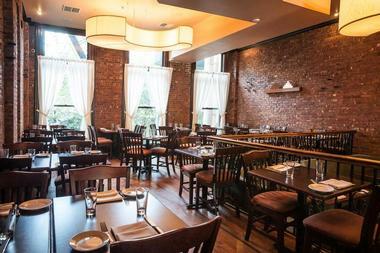 Brunch has a $19 Prix Fixe menu that includes an entree and a beverage. Otherwise diners can go for the frittata with mushroom and jalapenos, the smoked pollock fish cake with chipotle aioli, and the fried portobello sandwich with pesto and goat cheese. Brunch is offered from 9:30 a.m. to 3:00 p.m. on Saturdays and Sundays as well as on major holidays such as MILK Day, Memorial Day, and New Year’s Day. Stone Park Cafe is the brainchild of childhood friends Josh Foster and Josh Grinker. Since 2004, the cafe has been offering food made with fresh, seasonal ingredients. The brunch menu is extensive and has a wide variety of meals that could satisfy even the most particular palette. For only $15 you can feast on pan seared bluefish cakes with caper hollandaise, short rib hash and eggs, or hang town fry which comprises an oyster frittata with bacon and Cabot cheddar. There are four different styles of omelets to choose from, or you can build your own with a combination of andouille, Canadian bacon, house sausage, cheese, and many vegetables. If you’re looking for some down-home Southern comfort food with a gourmet touch, Sweet Chick is the place to go. 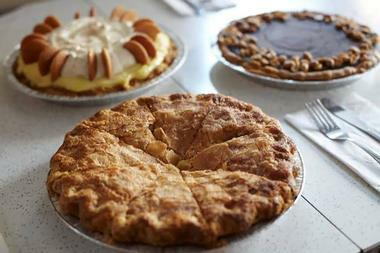 The spot is known for serving some of the best fried chicken and waffles in New York City, while the home-baked desserts will satisfy your sweet tooth craving. Brunch is offered on the weekdays as well as the weekends, with delicious items such as mac and cheese and ricotta pancakes on the menu. The weekend brunch is a great opportunity to try the famed chicken and waffles, house made granola, or the eggs benny with shredded smoked chicken. Brunch is a satisfying and delicious time at the Farm on Adderley. Every weekend from 10:30 a.m. to 3:30 p.m., you can indulge in delicious culinary concoctions that really hit the mark and satisfy cravings whether they be sweet or savory. Diners can choose something simple but full of flavor like the farm omelet with field greens or the grits and eggs with roasted tomatoes. For a heartier meal, you could have the veggie burger with cabbage slaw and hand cut fries or the farm burger, which places pasture-raised beef on an English muffin and comes with hand cut fries. 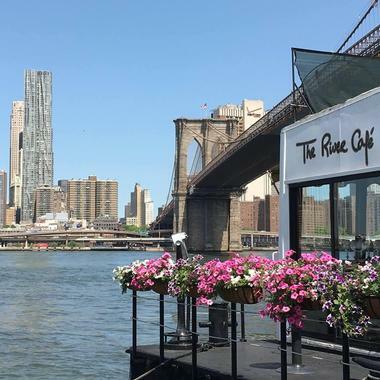 The River Cafe is where you want to go if you crave a delicious breakfast or brunch in Brooklyn while enjoying stunning views of Manhattan’s skyline and the Statue of Liberty. The restaurant is nestled riverside under the Brooklyn Bridge and is renowned all over the world. 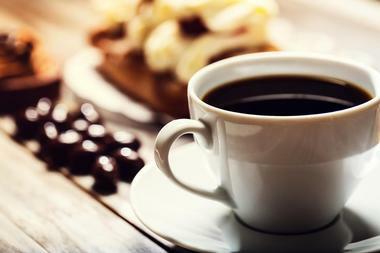 For over 40 years diners have been heading there for breakfast and brunch. From 8:30 to 11:30 a.m. you can feast on wagyu pastrami, smoked salmon benedict, or a three-four-minute egg topped with Wild Hackleback Caviar. Brunch is served only on Sundays from 11:30 a.m. to 2:30 p.m. and has chilled east and east coast oysters, scallop ceviche, and crisp duck egg on the menu. 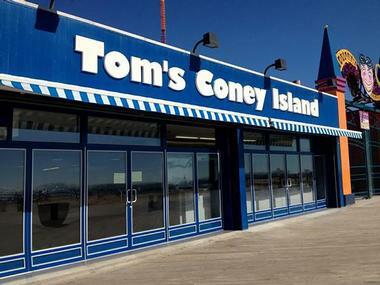 Family-owned and operated since 1936, Tom’s serves hearty breakfast and brunch options every day of the week. The laid-back and fun atmosphere has an indoor and outdoor dining area that makes for a great place to dine with friends and family. 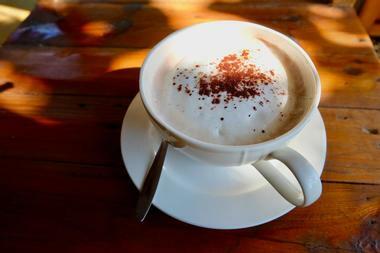 The bustling and lively ambience is wonderful and makes it a great place to unwind after a strenuous week or long night. There is an extensive pancake collection on the menu such as sweet potato, banana walnut, mango, and lemon ricotta. Other must-try dishes are the sausage and eggs or the eggs benedict with home fries. 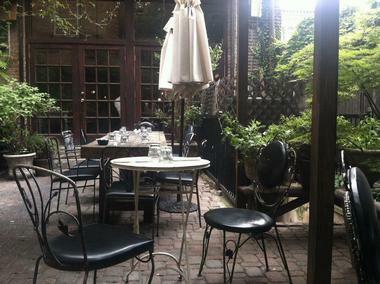 Vinegar Hill House is a relaxing restaurant on the historic part of the Brooklyn waterfront. They use the best ingredients possible to create artful and satisfying meals. The weekend brunch is available from 10:30 a.m. to 3:30 p.m. and can be had under the cherry tree in the peaceful garden when the weather is nice. The seasonal fruit sourdough pancakes are a delicious treat diners of all ages with enjoy. The hearty burger and chips can be accompanied with Benton’s bacon, cheddar grits, fried potatoes, or seven-grain toast and jam for a delicious brunch combination. Allswell is where you should head if you find yourself in New York and craving a delicious brunch with fresh, seasonal ingredients. The rustic American pub works with purveyors and farmers to create delicious culinary concoctions for their weekend brunch. While the cinnamon toast, ginger granola, and avocado toast are popular options, other must-try items include huevos rancheros, the hot pepper home fries and eggs, and the smoked salmon cake that comes with two eggs. There are five burgers on the brunch menu too; the classic allswell and the pioneer burger are particularly enticing. Diners can substitute any burger with a grilled koji portobello mushroom for a vegetarian alternative.